It’s still Saturday, December 7, right? Whew! And Christmas hasn’t come and gone yet I don’t think. I’m safe … well …. kinda. You see, it’s my turn on the 12 Days of Christmas Holiday Home Tour to wow you with my wonderful holiday decor that I’ve worked tirelessly on for the last two weeks. Assembling. Nailing. Gluing. Sewing. Taping. Wiring. Winding. Primping. Poofing. Fluffing. you were supposed to do Wednesday, Thursday, and Friday. And you do it! You get it ALL done! And you’re so excited because it’s everything you dreamed it would be. You pull out the camera and you start taking pictures. You stand on the bed. You lay on the floor. You climb on the ladder. You stand on your head. You creep into the farthest corner and cram your head back as far as it can go and tuck the camera under your chin to try and get the full room shot. Your sweet college boy says, “Mom, are you hungry? I’m going to McD’s. Do you want anything?” Yes! You stop for three minutes to scarf it down. Go back, take a few more pictures. Now to transfer all those pics to your computer, pick ten of the best pictures, edit them a teeny bit, watermark them, load them up, write a fascinating post, publish it, and call it a week. There’s only one itsy bitsy, teeny tiny problem. EVERY SINGLE PICTURE IS HORRIBLE. I’m not just talking about a couple of blurry shots. Its more like every bloggers worst nightmare … something is freakishly wrong with the camera and all the pictures look like they were taken on an old Kodak Instamatic Disposable Camera … and it’s nothing like the cool retro actions from Instagram. The colors are all off and they’re grainy like they’ve been overlayed in grits. So here I am at 8:30 on Saturday night staring at the computer, possibly shedding a tear or ten, wondering what on earth I’m going to do. And it hits me … go back ,,, go back to Christmas past. And so, today, you aren’t going to get a “Home Tour,” per se … instead I’m going to share our last Christmas with you … a Christmas we will never forget … our first Christmas here at Sunnyside Manor. The decorations were incredibly simple, mostly because I was having a really hard time trying to figure out how I wanted to decorate this house. After having decorated the same house for over 20 years, it was hard to switch gears. The kids insisted that we have a real tree. We’d had an artificial one for years, and we had promised them a real tree for our first Christmas here. It really was a gorgeous tree. But the magic of Christmas really began on Christmas Eve. Our oldest daughter and her husband were in the process of adopting a precious little boy, and it was the first time we got to meet him (they live in California.) All I wanted to do was take pictures of him … all day and all night. 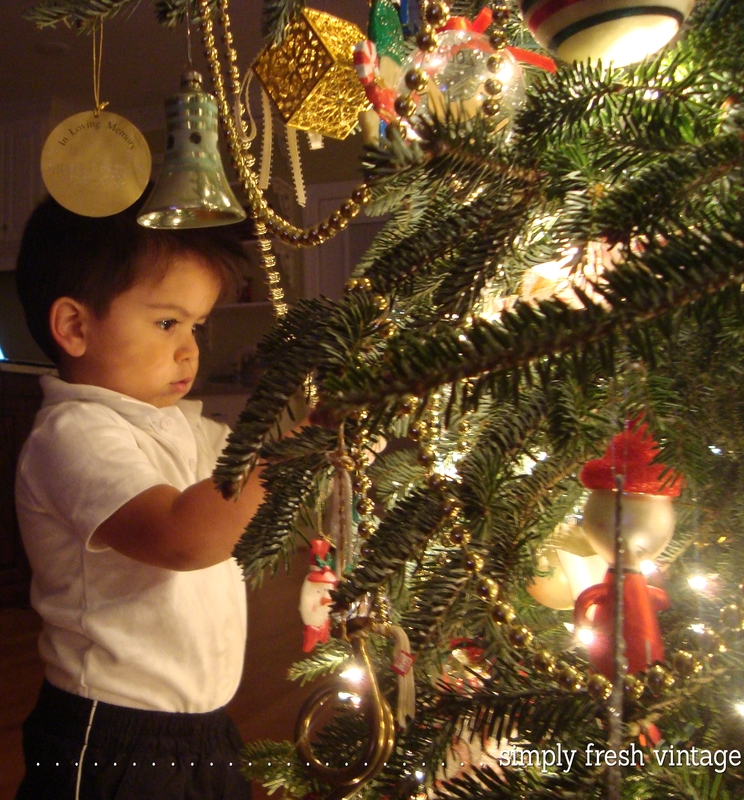 The look in his eyes when he looked at the tree and the ornaments … the wonderment … the awe … the reverance. Dad made everyone a huge Christmas breakfast. I love how they all gathered at the island … brothers and sisters … talking and teasing. And then it was time to open presents. And yes, at least a third of those are for the little guy. 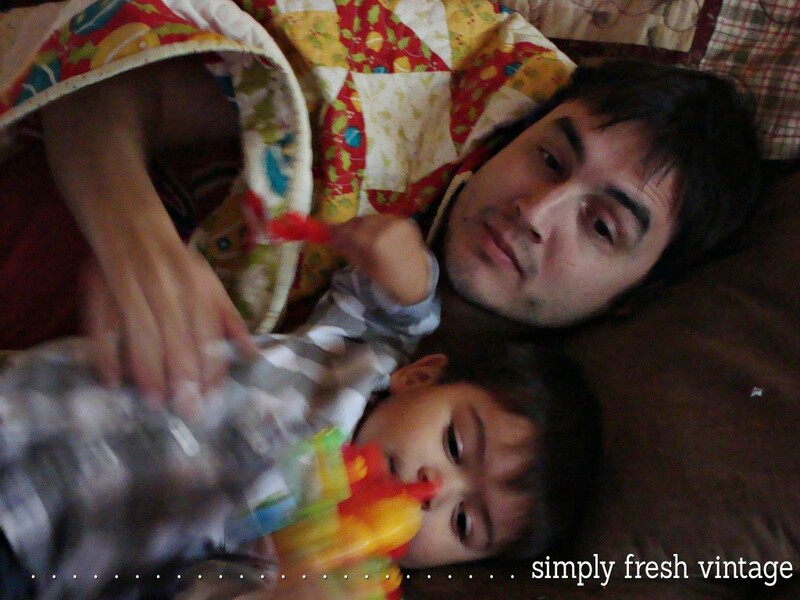 Talking, laughing, tearing, ripping … boxes, paper, tissue and toys … EVERYWHERE! 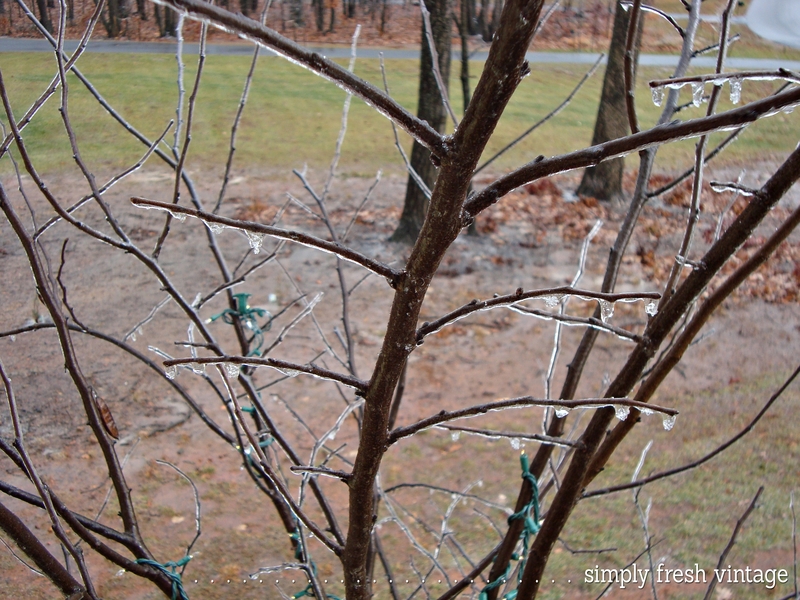 The next morning brought a beautiful weather surprise for all of us … freezing rain. That was something we’ve never experienced before. The word “ice” is not part of the central California weather terminology. As I was going back through these pictures, it was such a sweet reminder to me that no matter how beautifully decorated our houses are, when it really comes down to it, what really matters is that because God gave His Son to us as a gift, we can share His gift of love with others and enjoy and cherish the memories we create with those we love the most. I’d love for you to share a special memory of a Christmas past, won’t you? 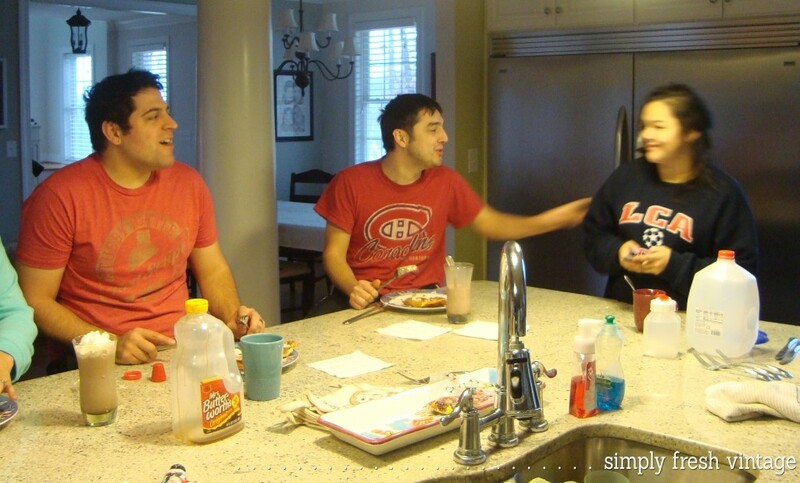 With our older kids and grandson living so far away, it’s super special to remember the wonderful times we share with them. Have a wonderfully blessed Christmas holiday! It’s often hard for us bloggers to focus on the Reason for the Season. This year, even in the decorating, I’ve tried really hard to keep in the front of my brain that it’s not about perfect garland and trees, but enjoying the blessings of those around me. So sweet Lani! Christmas memories are way more important that the decorations anyway. 😉 Thank you for sharing your heart with us! Thank you so much! 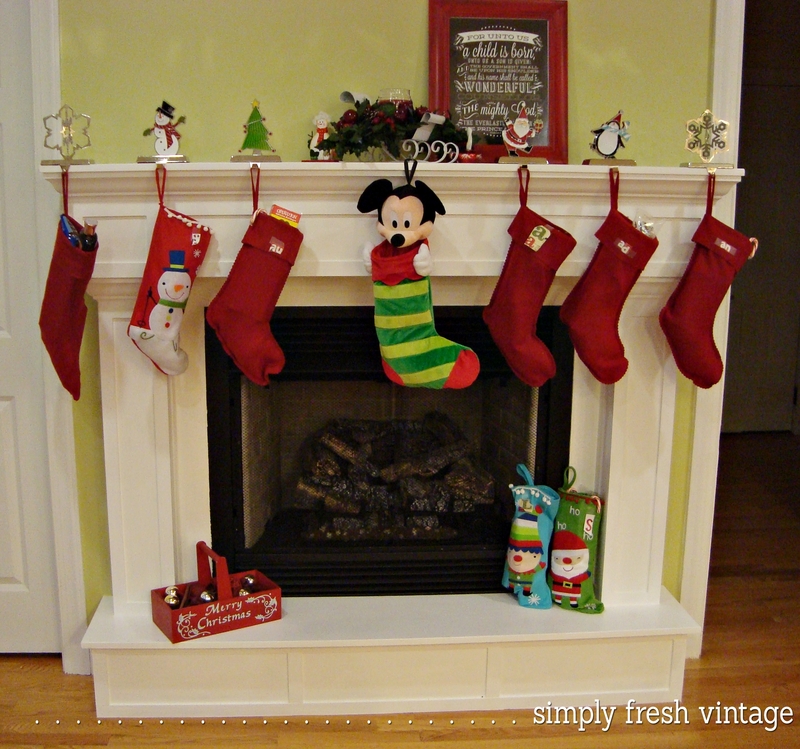 Some of my best Christmas memories are from Christmas’s that had hardly any decorations at all! Lovely post…and thank you for the reminder on what it’s all about. Your home and your family are lovely…such sweet pictures of everyone enjoying each other’s company. That’s the part about this post that makes me smile…happy to be on this tour with you. Happy holidays to you and your whole family. Happy holidays to you as well, Jeanette! It’s been so fun getting to know everyone through this tour. 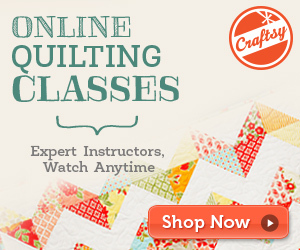 I’m looking forward to creating new blogging memories with everyone in our group! Thank you for reminding us that it’s not about the tree, the mantel, or the perfect wreath, it’s about family. I didn’t realize your on in central CA. We lived for 5 incredible years in Pismo Beach. Long before blogging, but in the high of building furniture and home decor items. I have to remind myself constantly that not everything I do or post must be Pinterest-worthy! At the end of the day, the ones I love the most don’t care how good it looked or not. We used to live in Sacramento, but moved to Virginia a couple of years ago. We have friends in Pismo Beach. Small world! So glad to be partnering with you on this tour also. Looking forward to many fun times together in 2014. Thank you so much Sonya. Life happens, right? And usually in the midst of a deadline! Thank you for your ongoing friendship … it means the world to me! Thanks for bringing the true meaning of Christmas to my heart. I am sad that you were all so sick. AND that your photos did not come out. BUT I am grateful for your sweet and precious story. This is what it is all about, right? Making memories and family time. Thank you so much. I can always take the pictures again. Come next year, this year’s tour will be another memory! Sounds like you had quite a week! I hope everyone is on the mend! 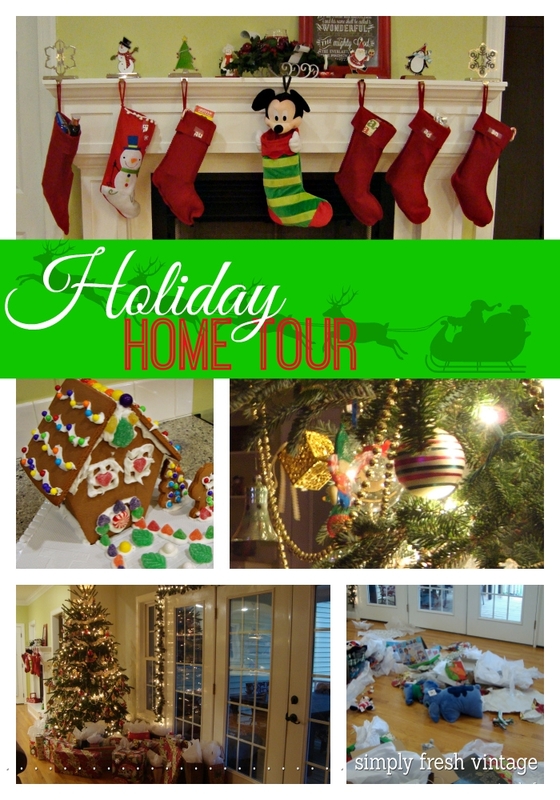 I love what you did with your tour– how fun to look back on all of the wonderful memories! Beautiful! Thanks so much for sharing! Thank you so much 🙂 It was quite a week, and it doesn’t seem to be ending! Tis the season 🙂 It’s always fun to go back in time, isn’t it? Awww Nancy … thank you, thank you, thank you! It was wonderful to go back in time. We won’t have the older kids and the grandson with us this year, so it was nice to relive that memory. And yes, as soon as I get my camera to behave, I’ll still have plenty of time to post about this years’ decor! Oh, Lani! This is just wonderful! I love your Christmas Past. I’m sorry your photos didn’t turn out but you’re a true blogger and just kept on going! Only one thing though . . . I was SO excited to see that you’re in California, only to realize that you’ve moved to VA. sigh. We were ‘neighbors’ and didn’t even know it, haha. Thank you so much Colleen! Where in California are you? We were both born in San Francisco and lived in the Sacramento area for over 20 years. Our older kids are still there so we travel back at least once a year. Lani, you’re kidding! I was born/raised in Placerville, moved to Sacramento right out of high school and lived there until 3 years ago when Mom got sick. So I’m back in Placerville. Grandson is in Sac so I’m down there every week or so. Wish I’d known you when you were still in Cali! Colleen, that’s crazy! So close, yet so far away! I’ll definitely have to let you know when I go back for a visit. Would love to get together with you! Aww! I loved seeing your sweet grandson and your children celebrate Christmas last year. Everyone looks so happy and content! I’m wondering if you might be able to take a similar icy picture today?? Thank you so much! 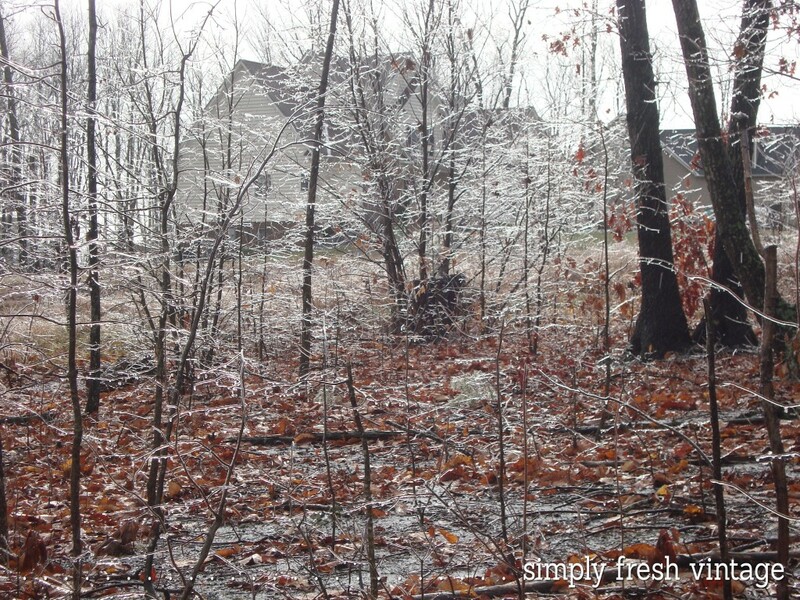 Yesterday wasn’t so great for new icy pictures, but this morning’s winter wonderland was amazing, wasn’t it? As I’m typing this, the sun just started peeking through and the ice is melting and dropping so fast. So beautiful! Aww Christy … now you’re making me tear up! You’re home is beautiful and I know so many happy memories are made there each and every day. May this Christmas bring you extra special blessings! 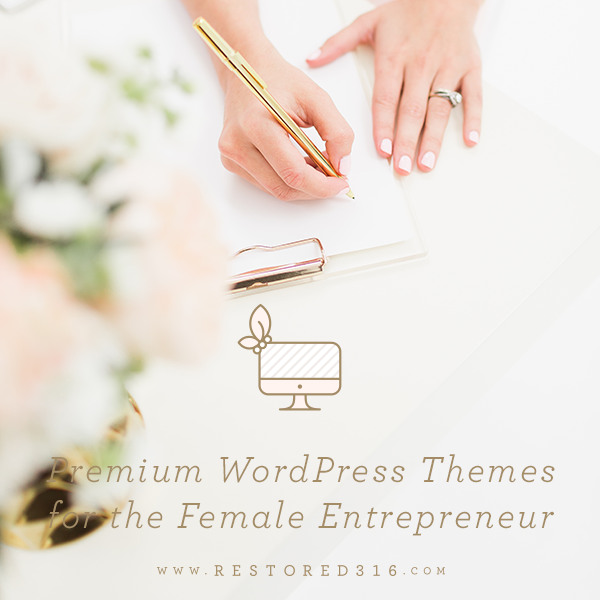 Hi Lani – I think this was absolutely a perfect post! I’m feel so bad that you had to be so upset over the photos and stressing and everyone sick. There’s a reason for everything and it was to share this lovely and touching look at the real meaning of Christmas. I love the photo of all the wrappings and tissue on the floor and seeing the little cutie in awe over the tree. Every one of my best holiday memories revolves around my family being together. Thanks for sharing your family, memories and the joy of Christmas with us! You are oh so very right! At the end of the day, it doesn’t matter at all how “beautiful” we made the house look. It really is all about the time spent with those we love. May this year’s Christmas day bring you and yours the best of memories! What a gorgeous tree! 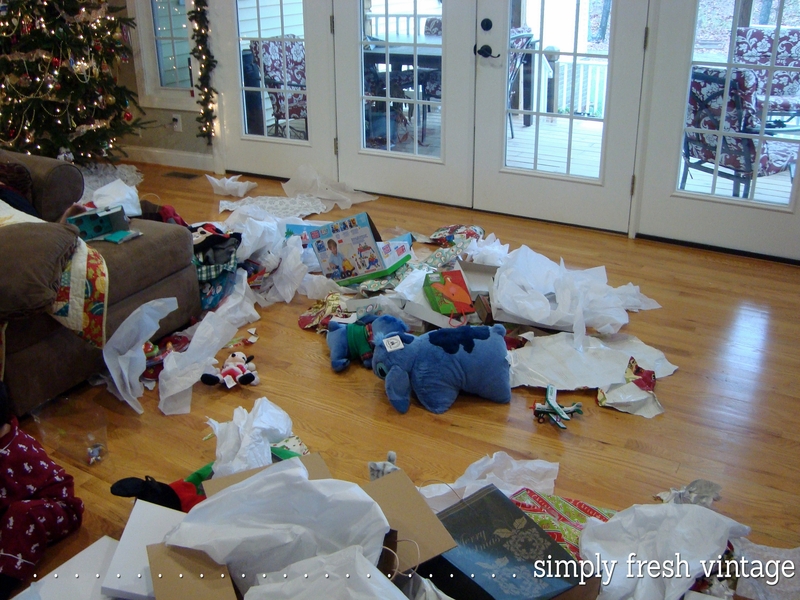 And I love the floor after opening the presents…that’s what it always looks like at my parents house when we’re all together….fun memories. What a cute little grandson! So glad he is a part of your family and got to be a part of the Christmas traditions. I bet he is excited for this year, too. Thank you so much Sharon! 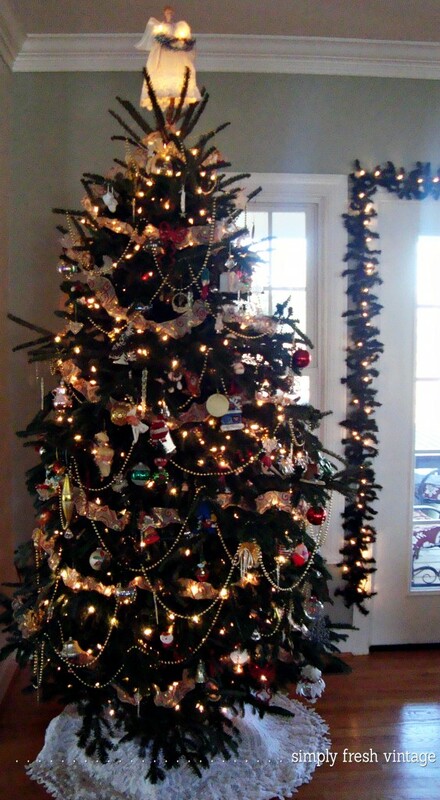 I think of all the holiday decorating, putting up the tree is my absolute favorite. No matter how many times you’ve moved, or where you live, hanging the ornaments brings back so many wonderful memories. Awww I’m so sorry your pics didn’t come out but I love this tour! 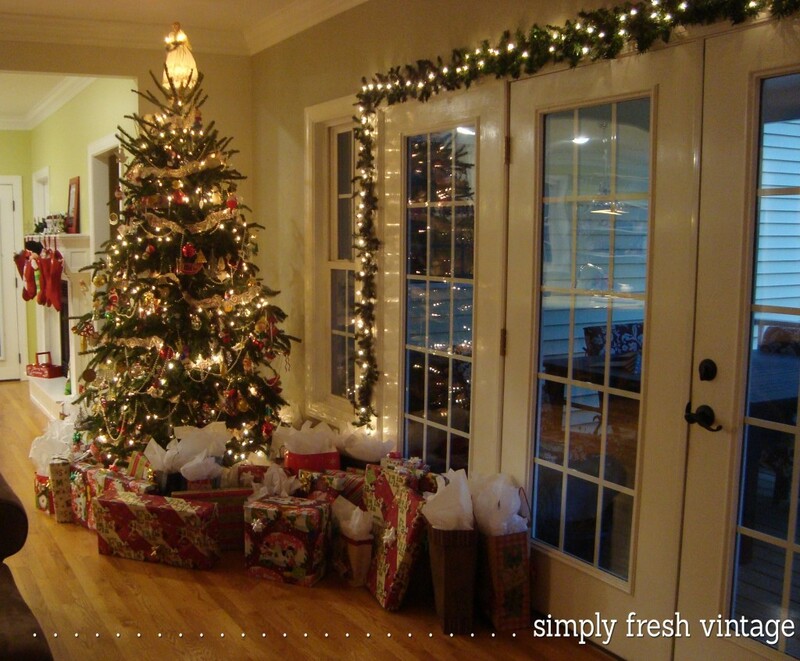 Your tree was gorgeous and I love that lighted garland around the door it’s so classic! And how adorable is your grandson!!! It looks like you had a wonderful Christmas that year so happy you shared it with us! Thank you so much! Our grandson is adorable. It’s so fun to have a little one in the family again. It really brings the magic of Christmas back to life! Oh sweet Lani, that was perfect! Thank you for sharing the real deal and keeping it centered on the real reason for the season. You are absolutely right! CHRIST is the reason for the season. No CHRIST …. No CHRISTmas!